Protein supplementation for workout fitness and weight- lifting doesn't necessarily have to involve enormous* amounts of animal protein, as is so often touted. Rich revealed in an article for MindBodyGreen that he uses a combination of plant-based source proteins for strength and endurance such as legumes, beans and grains such as sprouted brown rice. His article can be seen below, with a link to his website. WOW! 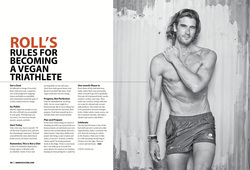 - Yet another truly amazing Vegan athlete!! For a complete and easy way to get powerhouse plant-based protein sources such as those recommended by Rich Roll, try EPIC Protein; ﻿Sproutein﻿; or Ultimate Life Meal. ﻿Below is an article that Rich Roll recently wrote for MindBodyGreen. He not only believes that not only is it possible to optimize your health on a plant-based diet; but, when done right, he highly recommends it. I field this question constantly. Despite deeply ingrained but misleading conventional wisdom, the truth is that you can survive without meat, eggs and dairy. Believe it or not, you can actually thrive, and never suffer a protein deficiency. Because no matter how active your lifestyle, a well-rounded whole food plant-based diet provides more than enough protein to satisfy the body’s needs without all the artery-clogging saturated fats that dominate the typical American diet. Delicious, nutritious and super easy to prepare. Trader Joe’s sells them pre-cooked and I’m not afraid to just eat them cold right out of the package for lunch or a snack on the run. Join the Plantpower Revolution for exclusive content, product discounts, giveaways and more. A fermented soybean-based food, tempeh is a healthy protein-packed alternative to it’s non-fermented cousin tofu. It makes for a great veggie burger and doubles as a tasty meat alternative to meatballs in pasta, or over brown rice and vegetables. A blue-green algae, spirulina is a highly bioavailable complete protein containing all essential amino acids. At 60% protein (the highest of any natural food), it’s a plant-based protein powerhouse that finds it way into my Vitamix blends daily. With a perfect ration of omega-6 and omega-3 EFA’s, hemp seeds are another bioavailable complete protein rivaled only by spirulina. A simple and great addition to a multitude of dishes, from breakfast cereal to salads to smoothies to vegetables and rice.